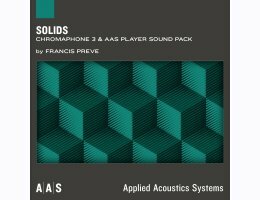 Applied Acoustics Systems releases the Solids sound pack for the Chromaphone 2 and AAS Player plug-ins in collaboration with AAS newcomer sound designer Francis Preve of Symplesound. Solids joins the rank of Chromaphone’s sound pack series which now add up to 10 titles and is available also in Chromophone & Packs Bundle. At times, Solids blurs the line between analog, FM, and physical modeling with punchy basses, delicate plucks, and ethereal pads — perfectly suited for synthwave and soundtrack productions. These 102 patches complement beautifully the original Chromaphone 2 factory library by combining both familiar keyboard classics with utterly unique experimental textures. The instant download delivery package includes both a Chromaphone 2 bank file and the free AAS Player plug-in. The AAS Player plug-in runs on both Windows and Mac OS X and supports the VST, Audio Units, AAX Native, and RTAS plug-in formats.